Over the course of my career as a wedding photographer I have seen so many unique decorating ideas for wedding receptions. I’ve seen tropical themed weddings with Tiki Bars and Steel Bands, winter weddings with stunning holiday displays, fall weddings when the foliage is at it’s peak color and casual summer beach weddings in the Hamptons with guests sporting sandals and Hawaiian shirts. The decorations seen here in this room were very beautiful and quite unique. This dining room is located at a wonderful waterfront catering venue on Long Island, New York: Land’s End in Sayville. Located right on the Great South Bay adjacent to the ferry docks where beach goers leave for Fire Island, Lands End features a huge ballroom with very high ceilings. 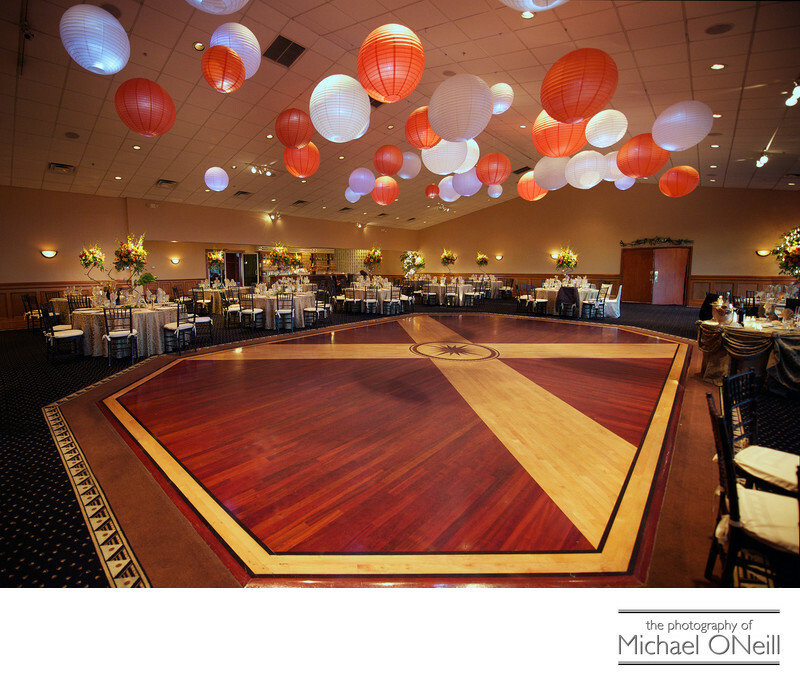 I loved the way this bride chose to decorate the room for her wedding reception with an array of different sized Japanese lanterns suspended from the ceiling above. It gave such a festive atmosphere to the room which also features a stunning dance floor with different wood inlays and a beautiful bar area with glass block walls. Land’s End is one of my favorite catering establishments anywhere in the New York/NYC area. If you are planning a wedding here and would like to discuss your wedding plans with a photographer who has had much experience in this venue give me a call here at my East Northport, NY studio and gallery.